So much build up for this little tutorial! I've had you saving your toilet paper tubes for an Advent calendar. Many of you already guessed. Counting down the days to Christmas, or the Winter Solstice, is such a fun way to build the excitement of the holiday season. For young children, whose concept of time is so different from ours, this is a very visual way for them to understand the passage of the days leading up to a celebration. For Chanukah, a garland of 8 tubes filled with gelt and little gifts is a wonderful extension to the magical Festival of Lights. Saving up a lot of tubes on short notice might not have worked work out for all of you. If you'd like to make a calendar anyway, you can easily fabricate a t.p. tube from a brown paper bag or craft paper. Cut out a rectangle that measures 4 1/2 x 6 inches . Form a tube by overlapping the width ends and stapling them. It will not be as sturdy, but will work just the same. decorative elements: fabric, scrapbook paper, ribbons, glitter, stickers, etc. 1. Cut four one-inch slits around the bottom of a tube. Cut an equal distance from each one. 2. You will have four sides to fold over, one after the other. Tape down after final fold. Scotch tape works, but duct tape (in clear) is the strongest. I will be going over all of my Scotch tape with duct tape! 3. Prepare all of your tubes this way. 4. Decorate each tube to your heart's content. We opted for simple. Our choice was a combination of aesthetic and the reality of decorating 24 tubes. We glued our strips of vintage and modern fabric to the center of each tube. 5. Flare out the top with little snips. Make up your own teqhniques and see what you like. My children love this part. 6. 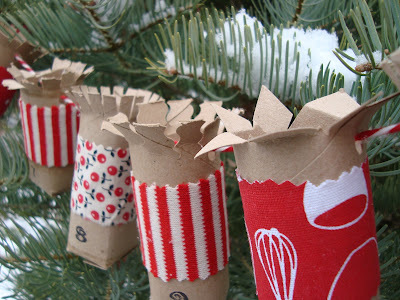 Arrange your decorated tubes in the order that you will hang them. We like to create a pattern. 7. Stamp your numbers on the front (the seam of the paper or fabric is the back side). You can also print out your numbers from the computer, use stickers, or write them on with a sharpie... you choose. 8. Punch holes on the top right and left side of each tube. 9. String your countdown calendar into a lovely garland. We used this luxurious baker's string. So far it's the only thing we've bought for our holidays! Start with the last number first. Hang in a place of honor. We will fill ours with treats and a new tradition. This year we will slip a "Time Ticket" into each tube, with some awareness of whose turn it will be to open on each night. I'm making a little chart that I will keep handy for everyone. What is a Time Ticket? A little coupon for special one-0n 0ne time with a parent, a sibling, or partner. Our time and love is our greatest gift. By giving in "present" form, we are showing how much we value it. I'm even going to have the children surprise one another with a few tickets to eachother. Haven't photographed those yet, but they should be sweet. Each coundtdown calendar has the potential to be as unique as the family that creates it. I'd love to see yours if you make one! And since I left my last comment earlier today, I have since accumulated an empty roll from our downstairs bath. 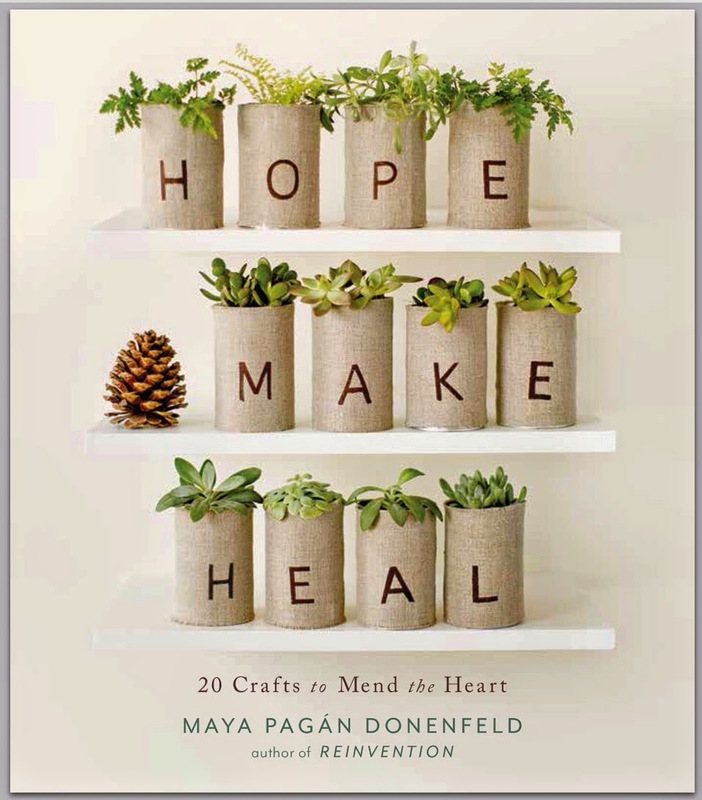 Thanks Maya for the wonderful way you take simple, ready available materials and turn them into something whimsical and wonderful. When my children were younger we had a different advent counting creation every year. My favorite but the most time consuming was when I split , emptied, filled with little presents and resealed and hung 24 walnuts. The children thought they were magic nuts and couldn't understand how the tree that they grew from could possibly have filled them with such wonderful presents. Little did they know. Maya, this is fantastic! 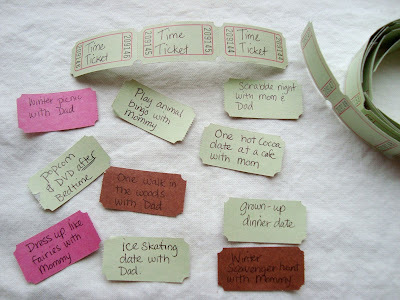 I especially love the idea of "time tickets" and giving them as gifts does show how special they are. Thanks for the great inspiration. I love the time tickets. Very creative and fun, as always! What a great idea. I love your sweet, sweet advent garland! And the ticket idea is such a nice statement of what you value. You could even make a little ticket pouch for each of you and include it in one of the holders (I'm a little nuts about pouches right now). I love it! It's so, SO cute! And major recycling bonus! I'll be linking. Oh, and did you see they listed you as an awesome crafty parenting blog over on ohdeedoh? You rock! Super cute and fun! 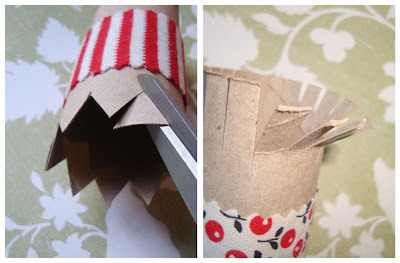 I suspect that you could also use empty wrapping paper tubes and just cut them to length if there's a lack of TP tubes. Or even paper towels. A very festive garland/advent calendar. I like how it's adjustable for the different holidays. I really like the time tickets :) Thanks for sharing! Hey, thanks so much for including the countdown to Solstice mention. Every year I tell myself I'm going to make a Sostice calendar and never do. Maybe this year since you've been so inspring! YOU HAVE AN AMAZING MIND MAYA! i love yours!! i also found another cute one. How fun! My sister gave us a giant machine embroidered advent calendar with pockets and filled them...the first year only. Now it is a bad habit I have to continue. The pockets are huge and since they had gifts...gifts are expected. So against my beliefs but I try to put little craft projects in the pockets to invite time together. I like this so much better...someday I will tell you about the "listening" jar and the special rewards in it. The power of attention and special moments are the memories that will last a lifetime. Great job Maya! I have just opened my new blog and we will start it with this wonderful activity. Thank you!!! 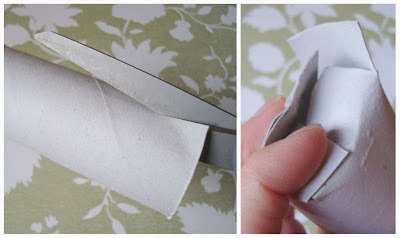 Did you know I have been keeping toiler paper rolls for weeks, without knowing what to use them for...? This is very very nice!!! I wished I had the courage to make this countdown calendar, but I don't have the spirit for crafting right now...I'm too patiently waiting for the baby's arrival hehe, so I do nothing instead, reading some blogs of which yours is of course my favourite!!! such a fun, festive and GREEN way to celebrate advent!! I love this! I think I will make some for the family this year. Thank you so much! Great, simple, practical idea. And I really like the Time Tickets. This is very cool! My daughter has been saving toilet paper rolls for a while now & I was getting a little annoyed with it to tell you the truth. Now we have something we can make! I already bought her an advent calendar, but this one will be a lot more special! Thanks for the idea & tutorial!! 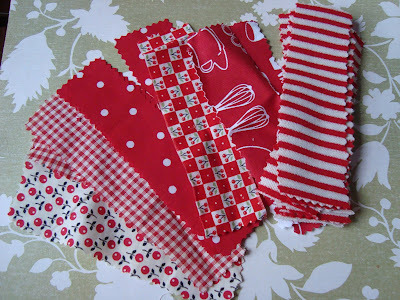 Where did you buy your red & white string?? I love this! I've been looking for something my sister and I can do with our kids to countdown to Eid al Adha (the Islamic holiday after the Hajj/pilgrimage to Mecca). It's coming up mid-December, and it's really very difficult to recognize our holidays when they fall in the same season as Christmas. Christmas really dwarfs other holidays since all the stores are playing music and putting out gift lists and so on. The displays are beautiful, and we celebrate Christmas with some of our family . . . Anyway. Enough rambling. The point is we only have two big holidays, and the last one fell right around Halloween. I felt like that one was lost as well. Striking a balance is incredibly difficult. But my son loves crafts, and I think this is right up our alley. I think this is something we will do for years to come! Thank you! I absolutely loved your post! And your advent calendar is just great! Uunfortunatelly it is too late to make our own, neverthless, there's always next Christmas. I'm so happy you're all enjoying this idea. One person's trash is another person's treasure! Mommy+Me- the link to the string is right next the stringing part of the tutorial. Let me know if you still can't find it. Adorable, easy and "green" idea, thanks! I would like to tell you that's a great idea ! What an excellent project idea! I am a Kindergarten teacher in a Jewish day school, and we always collect toilet paper rolls for projects. 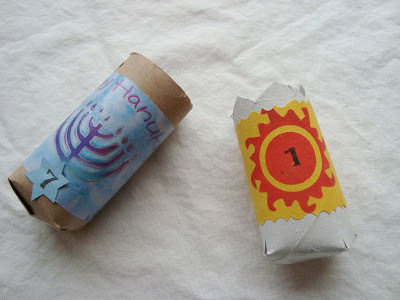 This is inspiring me with a great project to give to parents for Chanukkah! Wonderful tutorial Maya. If anyone could make something beautiful out of TP rolls, it would be you. So cute! 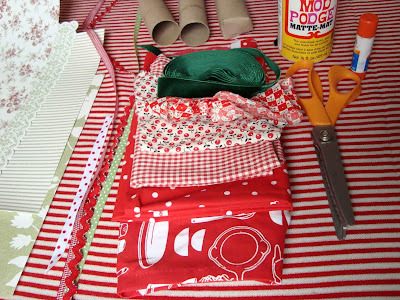 I featured it in today's Simple Makes post, "Best Advent Links: Preparing for Christmas." 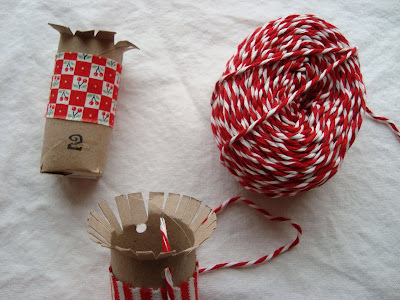 See it at http://www.simplemakes.com/2008/12/best-advent-links-preparing-for.html. Thanks for the great post! Davvero carino e siprattutto "ecologico". Maya- I just found this tutorial as I am now looking for an idea to make my kids an advent calendar. This looks like a great one and one I could do since I don't sew. :) I better start saving my tp rolls. For those wanting to avoid sticky tape/glue I folded the bottoms in an overlapping fashion like you'd do to keep box flaps closed. It seems pretty strong, especially if you press it in a little. I'm also going to make my own flour glue to affix the papers I'm using. I spent $6 on 6 pairs socks to hang (with plans to raid the sock drawer), but I think i might return them and make this instead. 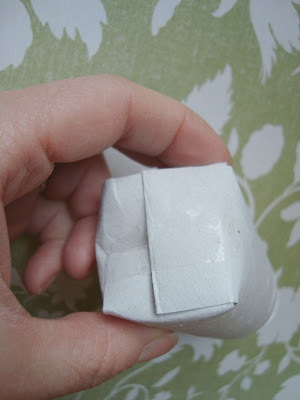 i love the idea of using what we have on hand (an abundance of tp rolls) and creating something so cute. My kids are still small but they will get such a kick out of this! Thank you! Love your blog, found this post via Urban Debris. Just a quick note that you could also use paper towel tubes, just cut them to a shorter length, and perhaps get at least two or three shorter tubes from one long tube. This is adorable! I would love to try it for Valentine's day!! Thank you for sharing! Thanks Heather, go right ahead! 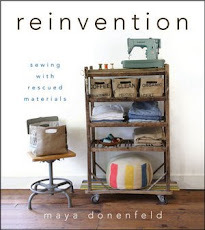 I love this little upcycling/recycling project so much I got all excited and included it on my blog yesterday. I have just come back and realised that I should have asked permission to use the photo. Maybe now my mom will forgive me for using so much toilet paper. I can take the rolls and make these beautiful calendars. This is really such a fun idea and very creative . Would like to link to my " How to make a Stuffed Advent Calendar " . Thanks for sharing . This is a great calendar! 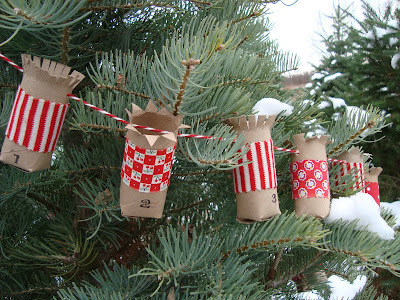 Thanks so much for sharing - we liked it so much, we've included it in our TP Roll Christmas Craft Roundup!